Originally, cryptocurrencies were created to allow fast and secure transactions without any middlemen (such as bank, for example) controlling the creation every additional unit of cryptocurrencies. But in present time, they are mostly used not as a payment method, but as financial assets. And as with any financial asset, it is rational to assume that there are interactions between cryptocurrencies’ returns and volatilities. The field of cryptocurrencies connectedness (that is how price shock of one affects prices of others) is not well discovered since the topic itself is young. Mostly, researchers investigate Bitcoin, and there are very few papers dedicated to altcoins. Among others, I would note the paper by Halaburda and Gandal (2014) which examines competition between 4 coins. 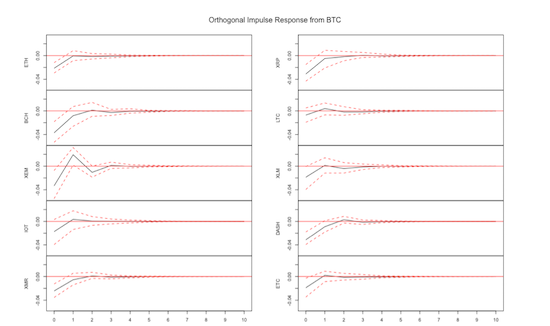 Authors explore correlations in daily closing prices and conduct Vector Autoregression analysis to see whether movements in the USD/BTC exchange rate ‘predict’ future changes in other digital currencies. But the size of used data is small, so results seem incomplete. Since more data is available now, I apply the similar approach to a larger dataset. 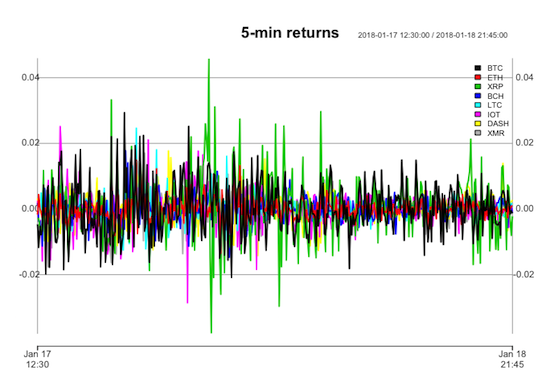 I use VAR analysis to investigate how cryptocurrency returns interact with each other, conduct the impulse response analysis and the Forecast Error Variance decomposition. 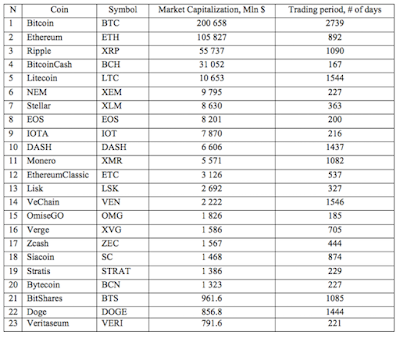 My dataset consists of daily, hourly and 5-min returns for 23 TOP-cryptocurrencies obtained from cryptocompare.com (see the list of coins in the Table below). On Figures below, you can see daily, hourly and 5-min returns for selected coins. I start VAR(1) analysis with daily data  (all tables are available here). Results show that lag 1 of Bitcoin price return positively affects other prices . BitcoinCash has a different direction of lagged influence (positive effect for Ethereum, Dash, EthereumClassic and negative for Bitcoin, Bytecoin, OmiseGO) and Miota negatively affects returns of other coins on average. To investigate the dynamic effect of returns, I conduct impulse response analysis. It shows: if there is a shock in Bitcoin price, majority of coins reacts in opposite direction, but after 3-5 days it wears off (figure below). In contrast, most of the coins have positive initial response for a shock in Ethereum, which decreases after day 1 (Figure 7). Also, impulse response analysis shows statistically significant results for Ripple, Miota, NEM, etc. Bitcoin explains about 10-15% of forecast error variance for such cryptocurrencies as Ethereum, NEM, Dash, Monero, Zcash (but interestingly, Bitcoin explain less for BitcoinCash – 6.8% even though it is obvious to expect high impact for forked coin). Ethereum contributes more in the forecast error variance of Ripple (13.4%), Litecoin (23.6%), Monero (25.8%), Ethereum Classic (28.8%), Zcash (31.6%) – that is higher than Bitcoin does. Bytecoin contribute to Siacoin (14.7%) and Doge (12.1%). 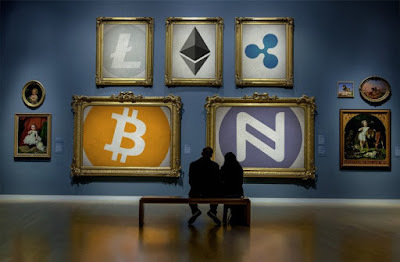 To sum up the first part of analysis using daily data: altcoins are influenced more by Ethereum rather that by Bitcoin and there exist internal interactions between TOP-20 cryptocoins besides their connections to the two largest cryptocurrencies. Now let’s look at VAR(2) model for hourly data. Lag 2: coefficients of Ethereum are negative in the equations for Bitcoin, Litecoin, NEM, Stellar, Miota, Monero, Lisk, Zcashs, Bitecoin, BitShares. Coefficients for Bitcoin are smaller and statistically significant in less number of equations. Among others, I would note VeChain with its negative effect on Ethereum, BitcoinCash, Litecoin, NEM, Stellar. I also perform impulse response analysis which provides similar results to daily specification. 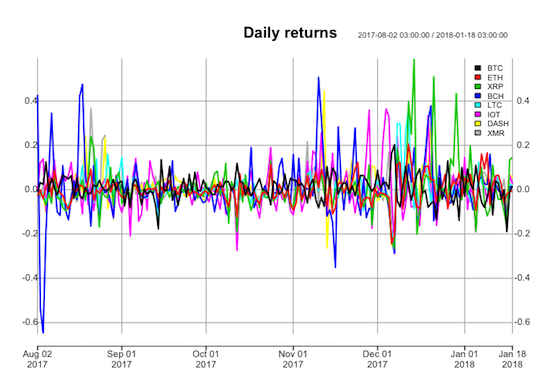 Looking at the forecast error variance decomposition: as for daily data, most of the variance of the forecast errors for coins come from its own innovations. But the difference is that now Bitcoin shocks are leading in contributing to forecast error variance for other cryptocurrencies (20-30%), compared to Ethereum (10-15%). Shares of other altcoins are less than 1% on average. Thus, based on VAR(2) analysis for hourly data, Bitcoin and Ethereum play the central role in explaining the forecast error variance of cryptocurrencies. Both lags of NEM provide negative influence on coins, Litecoin and Stellar lag 1 coefficients show negative effect on Bitcoin, BitcoinCash, Miota, Monero. Forecast error variance decomposition shows that Bitcoin contributes to more than 30% to forecast error variance for the majority of coins, reaching 60-70% for Ethereum, BitcoinCash, EthereumClassic, EOS. The coins that are not affected by such high influence are Lisk, VeChain, Veritaseum and Verge. Forecast error variance of currencies explained by Ethereum is about 1-3% on average, which is much less than was observed in daily and hourly data. Most probably, such results are due to data and the situation on the market itself that was happening on January, 17 (South Korea announced possible bans of cryptocurrencies trading). During this shock, Bitcoin and Ethereum lost about 20% and 30% of its value respectively, as well as other coins. Anyway, this example also provides useful insights: analysis of the shock time period shows that Bitcoin remains the most central player on cryptocurrencies market, and even Ethereum still cannot reach it. Estimated models suggest that within daily periodicity, there are more interactions between cryptocurrencies returns, meaning that altcoins can affect and influence each other. In contrast, for hourly specification, the impact of Bitcoin increases and, it contributes 3-4 or even 5 times more explaining other coins variances compared to the daily model. 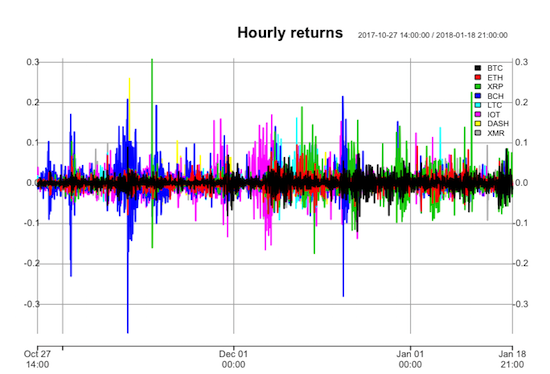 The example of VAR modelling during shock period exhibits strong central role of Bitcoin at cryptocurrencies market. Thus, regarding chosen strategy (long-term HODL or short-term trading), investors should take into account existing connectedness of coins market. Presented analysis can be considered as a preliminary work for future research where one can apply more advanced models which would provide deeper insights into cryptocurrencies market networks.